Product #60729 | SKU 22020 | 0.0 (no ratings yet) Thanks for your rating! 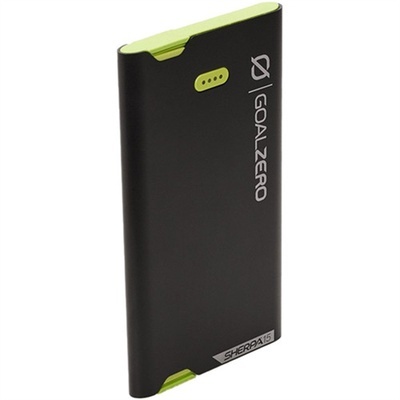 The Goal Zero Sherpa 15 Micro/Lightning (Black) is a phone recharger with built-in cables for ultimate convenience while charging on the go. Features 3,870 mAh and 2.1 USB output ideal for charging phones, with built in micro USB and Lightning cables. Fully recharge the Sherpa 15 from the sun in about 4 to 8 hours by connecting a compatible solar panel. You can also charge this power bank through the micro-USB charging port and standard wall charging in about 2.5 hours. The Sherpa 15 is great for charging your smartphone and other smaller devices. Smartphones get 1 to 2 recharges, headlamps get 2 to 4 recharges, and POV cameras get 2 to 3 recharges.